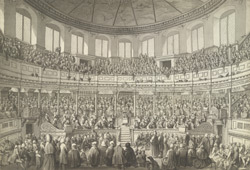 A view in ink showing a packed Sheldonian Theatre at Oxford, ''during the commemoration'', drawn in 1781 by S.H. Grimm. This building has the distinction of being one of Christopher Wren's first pieces of architecture and also the first building in Oxford to be built in the fledgling classical-baroque style. It was built between the period 1663-9 and financed by Wren's friend and fellow professor, Sheldon. Sheldon, who was Professor of Geometry and later Archbishop of Canterbury, donated £12,200 in order that the University should have a theatre in which to hold university ceremonies. They had previously been held in St Mary's Church. As can be seen in this view, the interior composed of a large domed hall with painted ceiling, a series of galleries for seating and wooden columns, painted to look like marble. The Chancellor's throne and pulpits on either side were well carved by Richard Cleer.